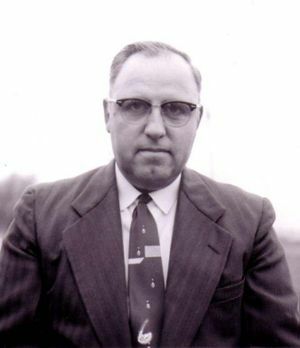 J. C. Hallman in the 1960s. Jacob Clare "J. C." Hallman: businessman, inventor, and church camp pioneer, was born 30 September 1912 near Petersburg, Ontario, Canada to Lizzie Ann Erb (17 May 1877-13 October 1956) and Bishop Manasseh Hallman (22 September 1874-22 February 1967). He was the middle child in a family of one daughter and two sons. Rheta "Catharine" Culp (9 December 1914-22 May 2012) became Jacob’s wife on 31 October 1942. They had one child-Alma Elizabeth. On 29 September 1991 Jacob died of as a result of a heart attack. The funeral was at First Mennonite Church in Kitchener. There was a pump organ in the Hallman home and Jacob removed the back to see how it worked. He installed an electric motor to save pumping the organ manually. This was the initial step in the production of his first electric organ. Starting with a production of two or three a week, Jacob’s invention became popular across Canada, especially in churches. But there also were installations in concert halls, cathedrals, and private homes. The organ manufacturing business became an important part of the J. C. Hallman Manufacturing Company, located in Kitchener, Ontario. It had 50 employees, and produced five organ models. The "Concert" model sold for $4,500 in 1956. The business was sold in 1977 after producing some 3,000 electric organs and 59 pipe organs. Jacob was baptized by his father at Mannheim Mennonite Church. As an adult he graduated from Ontario Mennonite Bible School (OMBS). OMBS held classes at First Mennonite Church in Kitchener, where Jacob and Catherine became members. Both were active in church-related activities all their lives. Jacob was a founding board member of Rockway Mennonite Collegiate in Kitchener, which opened in 1945. Also, he was a member of the Mennonite Choral Society, along with his brother, Elverne, and their cousin, David Bergey. Jacob was asked to explore the possibility of establishing a summer camp for Mennonite in southern Ontario. A Bible Camp property on Chesley Lake became available. As a result of a planning meeting held on 25 September 1947, shares were sold to finance the $20,850 required to purchase the Chesley Lake property. In 1948, Jacob became the first president of Chesley Lake Camp Association. He served on the board for 42 years. Catharine joined the board in 1952. At his memorial service, Jacob was referred to as “The father of Chesley Lake Camp Association.” In 1950, a chapel was built in a wooded area of the camp grounds. In February 1977 the roof collapsed, with the damage being such that a new chapel was erected. It was named Hallman Chapel “in recognition of J.C. Hallman’s contribution to Chesley Lake Camp and its spiritual programs.” With the assistance of Catherine and Elverne, Jacob also built a par-3 golf course on the camp grounds. During their times spent in Florida, the Hallmans were active members at Sunny Breeze Christian Fellowship in the Arcadia area. Jacob Hallman had a reputation as a tireless worker, and a modest man who didn’t seek recognition. Epp, Frank H. "J. C. Hallman Manufacturing Co. Ltd., Mennonite builds Electronic Organs at Waterloo, Ontario." 4, No. 47 (30 November 1956): 6-7. Hayes, Florence. “Hallman organs.” Encyclopedia of Music in Canada. Web. http://www.thecanadianencyclopedia.com/articles/emc/hallman-organs (accessed 29 October 2013). “Jacob Clare Hallman.” The Genealogy of The Cline/Moyer/Fretz/Nunn Families of Jordan Station and Louth Twp. 25 July 2012. Web. http://www.sandycline.com/family/html/fam06972.html (accessed 29 October 2013). “Jacob Clare Hallman.” Ezra Eby Revived! : Ontario Mennonite, Amish, and Brethren in Christ family history. Web http://www.ezraeeby.com/getperson.php?personID=I29993&tree=mennonite (accessed 20 October 2013). Rudy, Norma. A History of Chesley Lake Camp 1948-1998. Allenford, Ont. : Chesley Lake Camp Association, 1998. Gingrich, Del. "Hallman, Jacob Clare "J. C." (1912-1991)." Global Anabaptist Mennonite Encyclopedia Online. October 2013. Web. 21 Apr 2019. http://gameo.org/index.php?title=Hallman,_Jacob_Clare_%22J._C.%22_(1912-1991)&oldid=104911. Gingrich, Del. (October 2013). Hallman, Jacob Clare "J. C." (1912-1991). Global Anabaptist Mennonite Encyclopedia Online. Retrieved 21 April 2019, from http://gameo.org/index.php?title=Hallman,_Jacob_Clare_%22J._C.%22_(1912-1991)&oldid=104911. This page was last modified on 10 December 2013, at 12:41.